"Made for the modern princess, this classic organza plus size ball gown was designed with three-quarter lace sleeves and a flattering sweetheart neckline embellished with over 4,000 beads. The draping of the organza skirt adds the perfect touch of drama"
Features a fitted beaded bodice, zip-up back which is covered with decorative button, above this is a sheer mesh back which buttons up. The skirt is chapel length and has a stunning organza overlay. 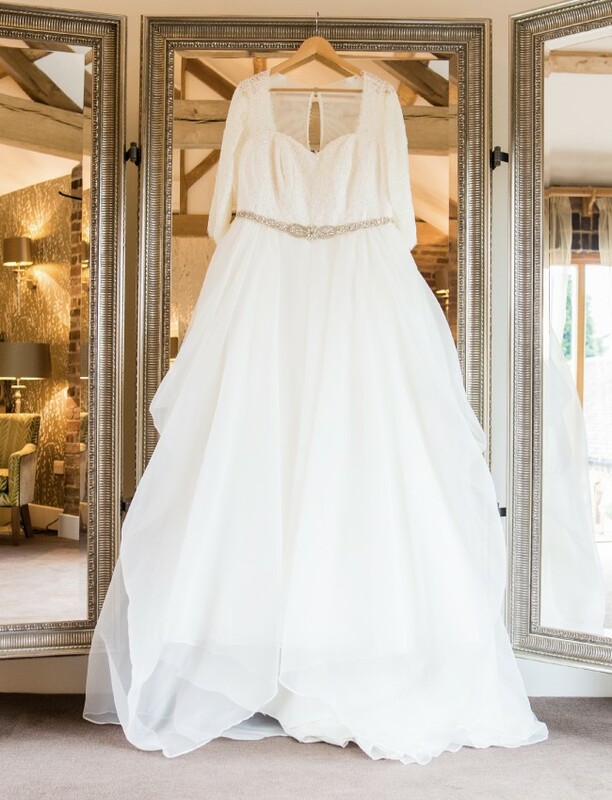 It has been worn once and has been dry cleaned using a special wedding dress cleaning service, which includes the use of a UV light to detect stains such as white wine which are invisible to the naked eye, which have then been treated. It has been stored in cool dry conditions in acid free tissue paper and decorative box. If you have any questions please don't hesitate to contact me, I am happy to help. A bead and diamonte belt has been sewn onto the waist ribbon to accent the waistline.